It was crystal clear why Richard Burright of North Albany-based NSExtreme had chosen to participate in Monday’s Willamette Innovation Network Expo at the CH2M Hill Alumni Center. He had a signboard in front of his booth that said he was looking for: a technical cofounder, additional seed funding and beta testers. Burright makes software that extreme sports enthusiasts can load into their iPhones, which they mount on their helmets and use to shoot video of their rides. The software helps the riders “improve their performance by analyzing things on a frame-by-frame basis,” Burright said. Burright said he still is testing his software and hopes to have it on the market by early next year. Burright had some competition Monday. 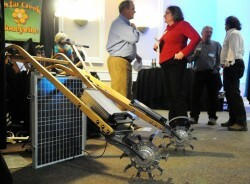 Brad Attig of Carts and Tools Technology Inc. was receiving lots of attention for his high-tech battery-operated roto-tillers. He was showing off both a sleek all-metal model and a more retro version, with wooden handles. Attig’s plant is at Northwest First Street and Van Buren Avenue, but his market — like it is for a lot of the startups on site Monday — is a virtual one. Attig went live on the web in June and shipped his first model in August. Nearby, Dan Coyle of Natural Fiber Helmets in south Corvallis was showing off his striking custom-made wood and cork bicycle helmets. Coyle said he has sold more than 100 of the high-end (approximately $400) helmets, with customers on five continents, but he also said it’s important to be visible in Corvallis, which is why he bought a seat for the expo. Or accept compliments from a satisfied customer. Bill Dean of Oil Ex Tech displayed another side of the expo: the influence of Oregon State University. Exhibits from the university’s advantage accelerator were right inside the front door of the Alumni Center, and Dean, a former Hewlett-Packard employee, spent two years as an entrepreneur in residence at OSU working on his plan to use microwaves to extract oils from items such as mint and lavender. Now he’s planning to go back to HP, by occupying space in the Microproducts Breakthrough Institute in Building 11 on the HP Campus.